Children aged 12 and younger are invited to wear their Halloween costumes and enjoy this free event that offers a safe alternative to traditional trick or treating. Parental supervision is required. Austin College Police will be on patrol during the event that is hosted each year by the local chapter of Alpha Phi Omega (APO) national service fraternity. Fifty-five student groups, nearly every student organization on campus, will be represented at ’Roo Boo, with students running games and fun activities for children and offering lots of candy. 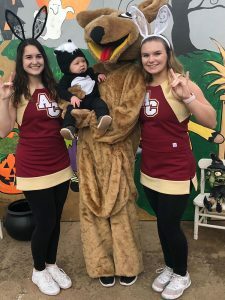 The event will include a bounce house, animal balloons, and various games, booths, and prizes.Last year’s ’Roo Boo brought out more than 1,500 visitors, and the students expect this year’s event to be even bigger. In preparation they are providing even more activities, according to senior Allie Armato of Irving, who is coordinating the event this year. APO has added a magician and a fun house to the agenda and spread some activities next door to Ida Green Communication Center for safety and ease of getting around. In addition, the Sherman Fire Department will have a truck on campus for the children to see. Alpha Phi Omega is all about service, Armato said. “This event allows us to reach many so many people in the community in just one evening—and it’s a lot of fun for everyone.” Local businesses are asked to make donations of gift certificates or candy for the Austin College event.